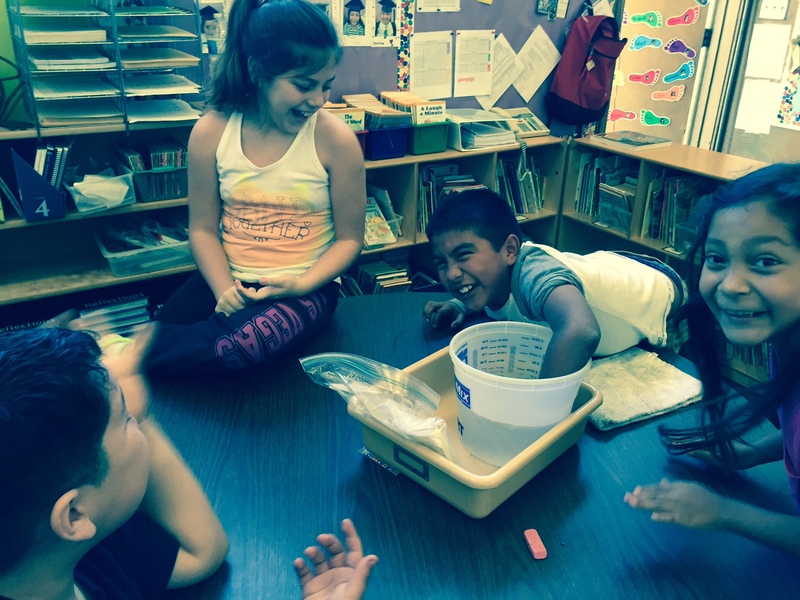 Introduction: The Grade 5 Physical Science Unit focuses on matter and its properties. All of the Grade 5 California Science Content Standards for Physical Science are addressed in this unit. By the end of the unit students will know: elements and their combinations account for all the varied types of matter in the world, all matter is made of atoms, which may combine to form molecules, each element is made of one kind of atom and that the elements are organized in the periodic table by their chemical properties, differences in chemical and physical properties of substances are used to separate mixtures and identify compounds, and changes in matter are due to heating, cooling, and mixing. The Grade 5 Physical Science Unit is presented to students through a series of investigations, experiments, active learning experiences, questions, and assessments. Assessments include: pre-, post-, and 4 formative assessments. Conceptual Flow Narrative: The Grade 5 Conceptual Flow Narrative for Physical Science: Matter builds on the concepts presented on conceptual flow graphic by describing the concept(s) addressed in each lesson and the links that connect each lesson to the next. Lessons are linked to the previous lesson and the lesson that follows via a conceptual storyline to ensure the development of student understanding as students progress from one concept to the next. After students have completed the Pre-Assessment, they begin their exploration of physical science with Lesson 1, “Observation Boxes.” In this lesson students learn that matter is all around us and can be described. Students also learn that matter has physical properties (e.g., color, relative size, shape, texture, composition, patterns, and odor) that can be observed, described, and used to identify matter. In the previous lesson, students learned about observable physical properties of matter. In Lesson 2, “Three States of Matter,” students learn that the physical properties of matter can be observed on the macro and micro levels. On the macro level solids keep their shape, liquids take the shape of their container, and gases expand to fill the container. On the micro level the spacing and movement of particles defines whether a substance is a solid, liquid or gas. Students make a model of the three states of matter using green peas. In Lesson 2 students learned that the physical properties of matter are observable. In Lesson 3, “Measuring Matter,” students learn how to measure some of the physical properties of matter using the tools of science: a graduated cylinder, balance, and a ruler. Students will then make quantitative observations of the physical properties of matter, such as, length, mass, and volume. In Lesson 3 students have been introduced to mass and volume as two physical properties of matter. Density is another physical property of matter. In Lesson 4, “Density,” students become aware that density is a physical property of matter that is determined as the relationship between mass and volume. Students investigate how closely the molecules of a substance are packed in a given space through hands-on experiences with brown sugar. Students also investigate the density of liquids through a liquid layers activity. In Lesson 4 students learned that matter has physical properties. Students also know that the physical properties can change. In Lesson 5, “Physical Changes,” students learn how the physical properties of a substance may change, yet the substance remains the same. In Lesson 5 students learned that when matter changes state or phase, it is still the same substance. As water changes state or phase, its physical properties change. In Lessons 6, “Ice Cube Demonstration,” students learn that heating or cooling (adding or taking away energy) may cause a physical change. Matter changes physically during phase change, however, it is still the same substance. After Lesson 6, students complete Formative Assessment #2. This assessment is aligned to the learning objectives of Lessons 5-6 and provides feedback to the teacher, students, and parents about student understanding of phase change. The teacher is able to use information from this formative assessment to determine if additional instruction is necessary for student understanding of the concepts presented in Lessons 5-6. In Lesson 6 students learned that matter can change and that a change in state is a physical change. Now students will learn another physical change: mixtures and solutions. In Lesson 7, “Mixtures and Solutions,” students learn about another physical change that can result in a mixture or a solution. Students learn that mixtures are the over arching category, and solutions are specialized mixtures. A solution is evenly mixed. In Lesson 7 students learned that mixtures and solutions may be separated into their original components by different methods. In Lesson 8, “Ransom Note,” students learn that chemical and physical properties of substances are used to separate mixtures and identify compounds. After Lesson 8, students complete Formative Assessment #3. This assessment is aligned to the learning objectives of Lessons 7-8 and provides feedback to the teacher, students, and parents about student understanding of mixtures and solutions. The teacher is able to use information from this formative assessment to determine if additional instruction is necessary for student understanding of the concepts presented in Lessons 7-8. In Lesson 9, “Black Boxes,” students connect what they have learned about the properties of matter to the structure of matter. Matter has observable physical properties at both a macro and micro level. Everything is made of something smaller, including matter. Matter is made of elements. The ways elements are put together make different types of matter. In Lesson 9 students made observations that led them to inferences about what was inside the black boxes. In Lesson 10, “Atoms: the Bohr Model,” students investigate matter on a micro level and zoom in on the basic unit of matter, the atom. Students learn that atoms are made of protons, neutrons, and electrons. The chemical properties of matter are based on the structure of matter. The number of protons in an atom determines the type of element. In Lesson 10 students learned that there are different kinds of atoms. In Lesson 11, “Making Molecules,” students learn that most of the time atoms do not travel alone. Atoms bond with other atoms to make molecules. When atoms bond with all the same type of atoms, they are called elements because they are purely one type of atom. Sometimes different kinds of atoms bond together. When this happens a compound molecule is formed. Chemical formulas are shorthand chemists use to indicate the type and number of atoms in a molecule. Students use gumdrops to make models of molecules. In Lesson 11 students learned about molecules and compounds. In Lesson 12, “Salty Ice Cream,” students learn that salts are compounds made of metals and nonmetals. Salts have properties such as hardness, brittleness, high melting point, and solubility in water. In Lesson 12 students learned that substances can be identified by its chemical properties and by the way it reacts with other substances. In Lesson 13, “Kitchen Chemistry,” students will observe chemical reactions and design single-variable experiments with kitchen chemicals. In Lesson 13 students were introduced to chemical reactions In Lesson 14, “Chemical Change,” examples of chemical reactions are presented to help students understand the indicators of chemical change. When one substance interacts with another substance, a chemical change may occur. After Lesson 12, students complete Formative Assessment #4. This assessment is aligned to the learning objectives of Lessons 9-14 and provides feedback to the teacher, students, and parents about student understanding of the states of matter, structure of matter and chemical properties of matter. The teacher is able to use information from this formative assessment to determine if additional instruction is necessary for student understanding of the concepts presented in Lessons 10-14. In Lesson 14 students learned the indicators of chemical change. There are five indicators that a chemical change has occurred: gas production (bubbles), color change, temperature change, precipitate formation, or light production. In Lesson 15, “Mystery Powders,” students apply their knowledge of the indicators of chemical change to the identification of mystery powders. After Lesson 16, students complete Formative Assessment #5. This assessment is aligned to the learning objectives of Lessons 14-16 and provides feedback to the teacher, students, and parents about student understanding of chemical change. The teacher is able to use information from this formative assessment to determine if additional instruction is necessary for student understanding of the concepts presented in Lessons 14-16. In Lesson 16, students noticed that there were three types of elements: metals, semi-metals (or metalloids), and non-metals. All metals have similar chemical properties. In Lesson 17, “Properties of Metals,” students learn that metals have common chemical properties, i.e., can bond with non-metals to make salts and physical properties, i.e., luster, malleability, thermal and electric conductivity. Throughout the unit students learned that elements and their combinations account for all the varied types of matter in the world, all matter is made of atoms, which may combine to form molecules, each element is made of one kind of atom and that the elements are organized in the periodic table. In Lesson 18, “Element Advertisement,” students demonstrate their understanding that elements on the Periodic Table, combined in various ways, make up all the matter in the universe. Metals have properties, such as, luster, thermal and electrical conductivity, and ductility. Non-metals are brittle, have little to no metallic luster, and are poor conductors of heat and electricity. After Lesson 18, students complete a post-assessment to determine their overall understanding of the concepts presented in the unit. Excited to try this. Downloaded entire unit but it won’t open. Also, where do you find the exit cards for each lesson. I was able to download the Entire Unti and unziped it will all working files. Do you get an error when trying to unzip the file “Grade-5-EarthScience-Complete.zip”? What lesson needs Exit Cards? Hey this is awesome stuff. Do you have any units on Force and Motion for 5th grade? Not yet. We are in the process of discussing how we can best address the new NGSS Standards. First, thank you so much for sharing your resources. I am planning for the 5th grade matter unit — there are currently no files liked to the Black Boxes lesson. It redirects to a website that is no longer active. You are very welcome! We are happy to share. Thanks for letting us know the link did not work. I have fixed the link to the Black Boxes lesson. Thanks for sharing such intelligent, well organized, insightful lessons. My students will love them. I so appreciate these lessons – my science class wouldn’t be the same without them! I’m having trouble finding the “Layering Liquids Data Sheet” for Lesson 5.4b. It wasn’t in the complete .zip file of all lessons or the .zip file of just Lesson 5.4. I can figure out how to make it, but if it’s available I’d love to just copy it. Thanks again! Is this lesson aligned to the new standards?